Whew, made it to Friday, been a whirlwind kind of week. We're back for more Follower Friday and this week we have with us..
Family: I have a wonderful husband of 10 years, 2 beautiful girls ages 8 and 4. I have a Great Dane, a mutt puppy and a bunny named Lola. Dream job: I would LOVE to own my own fabric shop, to be able to pet pretty fabric and be around it all day long and sew, sew, sew. Fabric line: Oh my – right now ‘Out to Sea’ is my all time favorite. I am loving the mermaids and the ship prints. 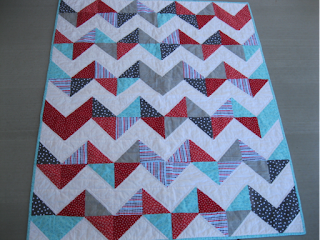 Project completed by you: My first Chevron quilt, my Taffy Pull quilt made from Ruby and my Rainbow Hourglass quilt. 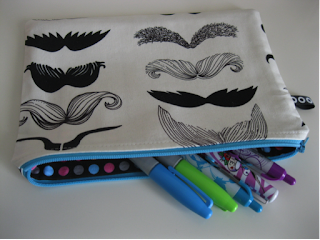 Project when you need a quick finish: I make ‘stash bags’…generously sized zipper pouches. I love to make them for an instant gratification. 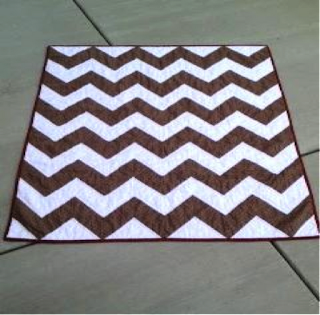 Color: I am not a huge fan of brown, which I didn’t realize until I got a custom order for the brown Charlie Brown Chevron quilt, and realized that I never pick brown when I’m picking fabric. Project completed by you: My first quilt attempted….it was a disaster and shameful. I used polyester batting (it’s EXTRA poufy), satin binding strips from JoAnn’s (EEEK) and I sewed the binding on backwards. Yup….backwards so the frayed cut edges are facing towards the quilt front, with the stitches sewn on the right side. Ugh. For some reason I couldn’t figure out bindings for the life of me. I went through a very dark time then. 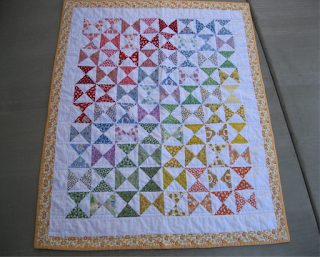 I swore I’d never do another binding, then I ran into an awesome tutorial and CLICK! I got it! 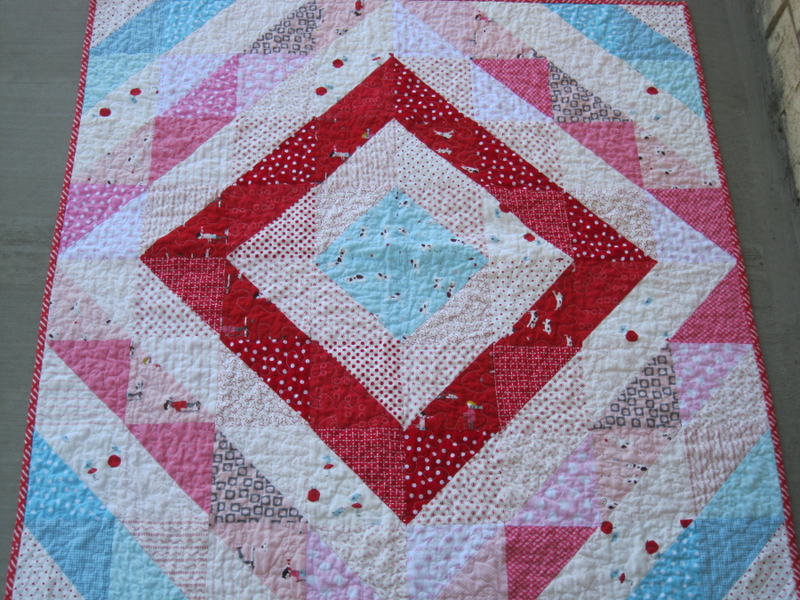 And now, binding is my most favorite part of the quilt process. I love to take it and sit on my patio and finish hand stitching it on. One of those things that once you figure out, you are like Duh-what was I thinking? Although I hated this first quilt creation of mine, my oldest Robot daughter loved it and has spent many nights cuddling with it. One of these days, I will cut that horrid satin binding off and replace it with something respectable. LOL. 1. 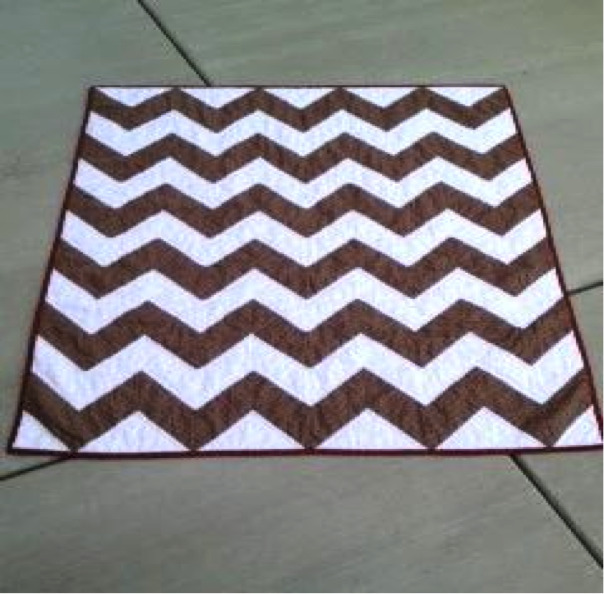 I’ve mastered stippling and I just ordered Angela Walters book on FMQ. 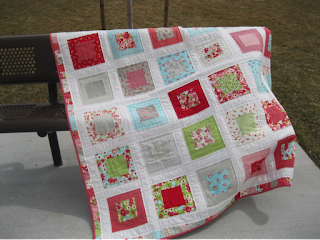 I am excited to learn different ways to FMQ. 2. I have a Robot quilt I have started (a Robot Mom needs to have a Robot Quilt!) from Bo Davis’ book, “Dare to be Square”. It is SO cute. So far, I’ve got the Robot head and an arm. I am tweaking the pattern a little bit as I’m a wee bit girly. I’m excited to finish this. 3. 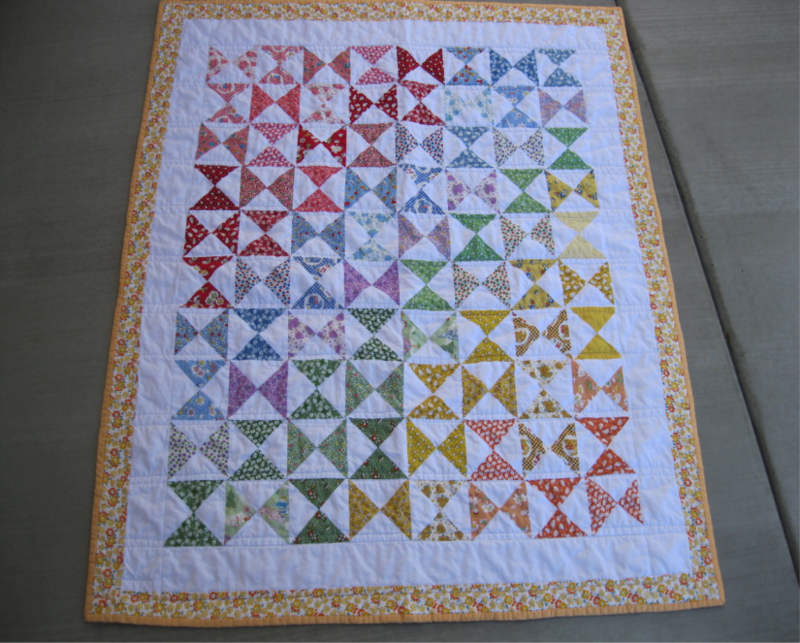 My little sister is getting married in December, so I will need to start on making the happy couple a quilt – of course! Thanks for joining us today Kimberly!! Thank you Jenn for featuring me! Love your blog and Follower Friday is so much fun!